Abstract: It's got everything you'd expect from a DVD-writer, including dual-layer DVD writing and reading, compatibility with both + and - formats, as well as support for lightscribe label burning. 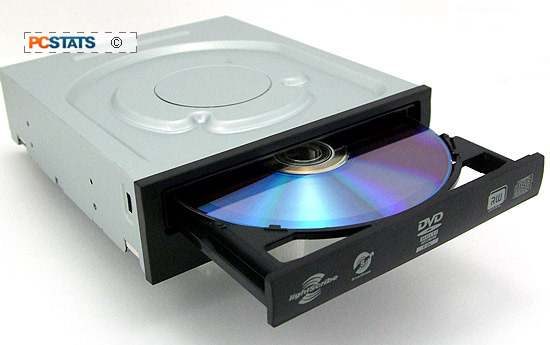 Optical drives have largely homogenized, save for a few neat features like dual-layer DVD burning or Lightscribe. 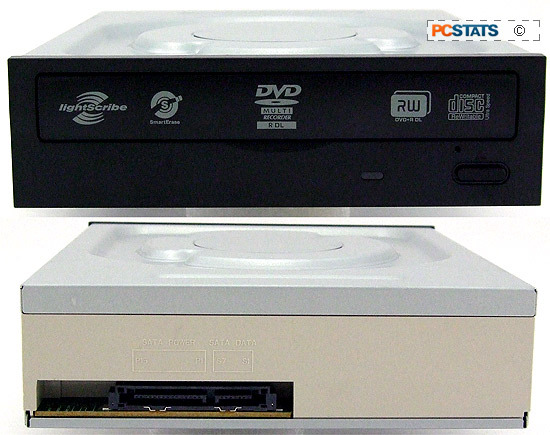 Compared to the rest of the computer industry, optical drives have evolved into a mature technology. For a good example of the features a modern optical drive should have, look no further than the Lite-On iHAS424 DL-DVD burner. It's got everything you'd expect from a DVD-writer, including dual-layer DVD writing and reading, compatibility with both + and - formats, as well as support for lightscribe label burning if you have photosensitive media. Of course, it'll also read and write CD-Rs and CD-RWs. SATA has largely taken over for IDE when it comes to optical storage, so it's no surpise to see that the iHAS424 has moved to the newer Serial connection. While the iHAS424 is an internal drive and will likely be a permanent resident inside your PC, thanks to its SATA connection it is hot-swappable. If you're in the market for a speedy new dual layer DVD burner the iHAS424 is as good a choice as any. The SATA optical drive is one of the new generation of 24x DVD writers, so it's easily fast enough to handle both movies and data discs. The drive that PCSTATS will be testing today is a retail model, which means it comes in a box along with a manual and some SATA cabling. Despite the packaging the iHAS424 isn't expensive, you can find them in most stores for just $30 CDN ($28 US, £17 GBP)! Lite-On's iHAS424 is designed for use in standard-sized computer towers and HTPC cases, so it'll fit into any free 5.25" PC expansion bay. The drive's specific measurements are 17 x 14.5 x 4.1cm, which make it a about average for an optical drive. As long as your case isn't tiny you should be able to install this optical drive without any problems. This DVD-RW drive comes in a stylish, slimming black... like pretty much ever computer peripheral these days. If you own an old beige box you might have to put up with some clashing colours, but then if you owned a beige box are you really all that concerned about how your computer looks? Writing modes for DVDs on the iHAS424 include DAO (Disc-at-Once) and Incremental Recording, as well as restricted overwriting and sequential recording. CD writing can also support TAO (Track-at-Once) and SAO (Session-at-Once) recording, in additional to mutli-session recording. Lite-on's iHAS424 drive uses a SATA connection rather than the IDE interface. SATA provides a lot of benefits over PATA, including greater bandwidth and lower latencies and the ability to hot-swap optical drives. SATA has largely taken over on motherboards in place of PATA connections, with many users building systems that eschew the older data interface entirely. Dual-layer DVD media can store 8.4GB of data, which is approximately twice that of its single-layer counterparts capacity of 4.7GB. This is because Dual Layer DVD media has two dye layers for data recording. Heat caused by the drive's laser beam modifies the physical and chemical structure of each dye layer to form patterns which can be read by the same laser (at a lower intensity) as digital data. Each dye layer is separated by a spacer and a metal reflector. The metal layer reflects the laser light, allowing the drive to 'read' the data by observing the reflections. The first reflector (positioned after the first dye layer) is semi-transparent; when the laser is focused a certain way, it will pass through this reflector and continue through to the second dye layer and bounce off the second metal reflector. This allows the drive to read the second layer of data. The second reflector is completely opaque and will not allow the laser beam to pass any further. Thus, by modulating the frequency of its laser beam, a dual-layer capable DVD-writer can read and write to dual-layer DVD discs. There are a couple of ways to indicate dual-layer media. The most common is 'DVD+R DL' but it's also sometimes indicated as DVD+R9. Obviously, both the drive and the media need to be dual-layer capable in order to access the extra storage space afforded by these 8.4GB optical discs! The iHAS424 DVD writer is compatible with DVD-/+R Dual Layer media at up to 16x write speeds. Next up, drive speed benchmarks.